Twenty-two women stuck in a legal limbo with their children are on a hunger strike in Pennsylvania. The women and their children are housed six to a room at the Berks County Family Detention Center in Leesport, Pennsylvania. They share a bathroom with a short curtain but no door. They’re awoken at 6:30 every morning for the first of several mandatory check-ins. During the night, a guard shines a flashlight into their eyes every 15 minutes. Most of them are badly sleep deprived. Many of their kids are showing symptoms of early childhood trauma and other developmental problems; some have stopped growing. The youngest detainee at Berks is 2 years old, and has spent around half of his life in detention. Like the other children, he isn’t allowed to sleep in his mother’s bed at night. They’re refugees who fled brutal violence in Central America and are now caught in a legal limbo. They were denied asylum after a cursory interview at the border and are subject to deportation. But attorneys representing them say that the screenings they went through at the border were legally flawed. The Obama administration claims that they have no right to appeal the decisions—a stark departure from longstanding legal precedent. They’re now being detained, indefinitely, while a legal challenge works its way through federal courts. PTSD was caused by a number of traumatic experiences when he was living in El Salvador, which has been exacerbated by a number of distressing experiences that have occurred during his prolonged detention in the United States.… As his stay in detention has lengthened, his symptoms have escalated and become chronic in nature, as a direct result of his experiences there and the lack of appropriate mental health intervention. The Nation spoke with a woman by phone from Berks whom we’ll call “Anna” (her lawyer asked that we omit any identifying information to avoid retaliation for speaking out about her situation). The young mother, a domestic worker in her early 20s, said that she made the arduous journey to the United States from a poor Central American country with her young son after “las maras” threatened to kill them. According to the Obama administration, the Berks mothers and children don’t exist; it claims that migrant children aren’t being detained for more than brief periods. Last year, a US district court ruled that the Obama administration was in violation of a 1997 judicial order known as Flores, which bars the government from detaining migrant children for more than a short period unless they pose a flight risk or a threat to national security. Federal District Court Judge Dolly Gee found that there were “widespread deplorable conditions” at the Immigration and Customs Enforcement (ICE) agency’s family-detention centers, and ruled that ICE had “wholly failed” to provide “safe and sanitary” conditions for the children it locked up. She ruled that the government had to release the families as quickly as possible, and could only hold them for a period of up to 20 days, on average. On August 3, Homeland Security head Jeh Johnson told reporters that the administration was in fact complying with the order, and that turned out to be the straw that broke the camel’s back for the Berks mothers. For the first four days of the hunger strike, ICE officials insisted that all the detainees at Berks were eating. In subsequent days, they acknowledged first that two of the women were striking, and then four; as of August 16, officials considered 16 of the 22 women to be hunger strikers. All of the women were found to be credible, but were nevertheless denied asylum. The issue, according to Lee Gelernt, deputy director of the ACLU’s Immigrants’ Rights Project, is that the women at Berks were denied asylum based on legally flawed screenings. “Either the wrong legal standard was applied, or there weren’t the proper procedural protections in place, or something else went wrong, legally, in their interviews,” he said. The ACLU filed cases in federal court on behalf of around 30 people, including the Madres Berks, who they say were incorrectly denied asylum status at the border. The lawyers haven’t demanded that the courts release the detainees, they simply petitioned for a neutral court to hear their claims under a writ of habeas corpus. 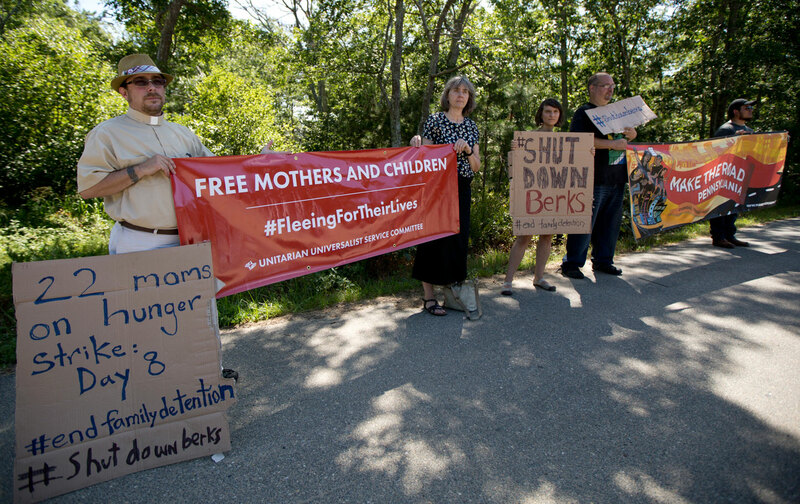 The Madres Berks are also caught in a for-profit detention system that affects many more people than a few dozen asylum-seekers challenging their orders of removal. There are tens of thousands of nonviolent immigration offenders stuck in detention centers while awaiting a hearing. Berks County Family Detention Center is the smallest of three facilities that house immigrant families with children. It’s run by the county for a reported $1.3 million annual profit, a significant sum in an economically depressed area. According to the Detention Watch Network, Berks is also one of a small number of publicly run facilities that has a contract with ICE that guarantees that the agency will maintain a minimum level of occupancy. The other two are larger facilities managed by America’s leading private prison companies. The South Texas Family Residential Center in Dilley, Texas—“Dilley,” for short—is run by the Corrections Corporation of America, and the Karnes County Residential Center is managed by the Geo Group. Dilley and Karnes are still locked in a legal battle to get licensed in Texas. Berks was licensed by Pennsylvania as a facility for juvenile delinquents and dependent children, but the state revoked its license earlier this year. A judge ruled that it could remain open pending an appeal by the county. In 2009, the Obama administration stopped detaining immigrant families, but it resumed the practice when a wave of refugees from Central America made headlines in 2014. Officials believed that detaining and/or deporting would-be asylees would prove a powerful deterrent for others who might be considering making the perilous journey to the United States. The Madres Berks and their children have spent up to a year caught between a rock and a hard place, and they may remain stuck there for months or years to come. The government has informed them that they can give up their claims and return home at any time, but they have good reason not to do so: According to an investigation by The Guardian, as many as 83 people sent back to Central America by the US government were murdered between January of 2014 and October of 2015.